Didier Deschamps was without top scorer Loic Remy, so Brandao was upfront. In midfield, Benoit Cheyrou started rather than Charles Kaboré. Claudio Ranieri made the fitness-related decision to omit Diego Milito, and instead play Diego Forlan and Mauro Zarate – otherwise, the side was as expected. A strange game here – Inter looked in control midway through the second half, but then increasingly invited pressure. 0-0 was probably a better reflection of the balance of play. Inter lined up roughly 4-3-1-2 shape, with Wesley Sneijder drifting over to the left of the pitch without the ball to cover that flank – although even when given no defensive instructions he tends to drift to that flank anyway. So, as we’ve seen in other games recently – Milan v Arsenal, PSG v Montpellier – we had narrow versus width. Interestingly, all these games have been Italian coaches against French coaches. This formation battle was complicated, however, by the fluidity of Inter’s attacking system, and it was a more flexible 4-3-1-2 than we often see from Italian clubs. Wesley Sneijder, while hardly enjoying a particularly fruitful evening himself, caused Marseille problems with his movement and made things happen down that side of the pitch. 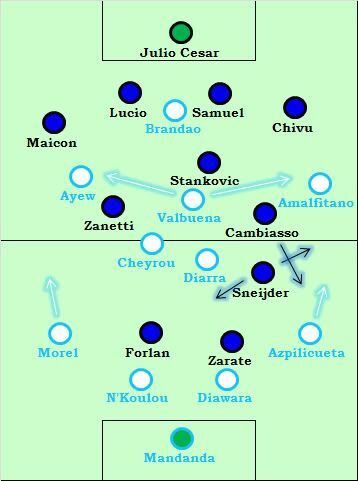 Marseille naturally viewed him as the main threat, but their determination to stop him, plus his unusual movement, resulted in both Alou Diarra and César Azpilicueta being concerned with his positioning. This meant that Esteban Cambiasso could motor forward down the left of the pitch untracked, and he was the game’s standout player in the first half – he created a couple of chances and had an attempt on goal himself. This was a particularly promising situation for Inter when one of the two forwards, generally Zarate, moved to that flank to further overload Marseille in the right-back position, though it should be noted that Azpilicueta coped well and had a very good game. Marseille were a fairly standard 4-2-3-1, and they knew that it was down the flanks that they needed to focus on, with both Azpilicueta and Jeremy Morel getting forward. However, it took a while for Azpilicueta to get forward and become a threat down the right because he was worried about leading Sneijder unattended, and for a while Marseille were too concentrated down the left, where Maicon and Javier Zanetti are very good defensively. Still, Marseille’s width meant a large number of crosses were attempted – nearly four times as many as Inter, although Lucio and Walter Samuel are happy enough dealing with high balls. The logic of this was sound – Inter packed the centre with three conservative midfielders, so Valbuena had no space to operate, and it was out wide where he was likely to get joy. However, with both him and Sneijder moving to the flanks, it did mean the game lacked a real creator in a central position. One man who could have solved that problem was Cheyrou, but he was too static and didn’t contribute enough to attacks. Often Marseille were simply attacking 4 v 7, then 5 v 7 when an overlap from a full-back came. Cheyrou could have been braver with his positioning and made some late runs into the box. Inter stepped up their attacking threat with Yuto Nagatomo on for Maicon – he was much better than the Brazilian, who may have been unfit. For a while Inter looked the better side, but both their forwards faded, while Sneijder created little. The game became rather dull in the second half, partly caused by Ranieri’s decision to move to a 4-4-1-1 formation: Joel Obi on for Zarate, and used on the left, with Sneijder becoming a support striker. As mentioned, the forwards weren’t particularly involved, and the new formation gave the full-backs more protection, so despite the eventual defeat it wasn’t a particularly bad move, although either Milito or Giampaolo Pazzini surely should have been introduced to play upfront alone. Still, better defending from the corner would have secured the draw, and it was primarily that rather than tactics that cost Inter. A game that seems dull from the scoreline was actually very interesting for a while – then Ranieri’s attempt to nullify the game by switching formation largely killed the contest as a spectacle, which probably indicates the move worked well despite the eventual defeat. He was, after all, trying to shut the game down. For long periods Marseille attacked intelligently but without enough quality to go ahead. They may have been marginally the better team by the end, but they were fortunate to nick a goal from a set-piece, and could do with Remy back for the second leg. Still, like allways a great work. Keep it up! Marseille – A draw would been a fairer result. They were strong defensively, though could be found out when broken against with their fullbacks still forward. Their dominance in the air at CB, meant Inter never looked to cross the ball really, with forlan not really a good target man. N’koulou also impressed me by tracking Forlan when he came deep, this stopped him using his passing skills to set up team mates. The fullback’s both gave good attacking good performances, helping to overlap, though there crosses weren’t very effective against Inters CB’s. The Spanish RB had a very impressive game in particular, he seemed to be targeted by Inter, but coped very well (look at Ivanovic to see how badly players can cope) and was a constant outball for Marseille. In midfield, Diarra had too many players to track, with Sneijder and Cambiasso getting the better of him through clever movement. Cheyrou mean while had much less responsibility and was allowed to dominate the game, allowing Marseille to dominate possession. He started most of the marseille attacks and his range of passing was very impressive, though as ZM said, he could got forward more to attack the box. 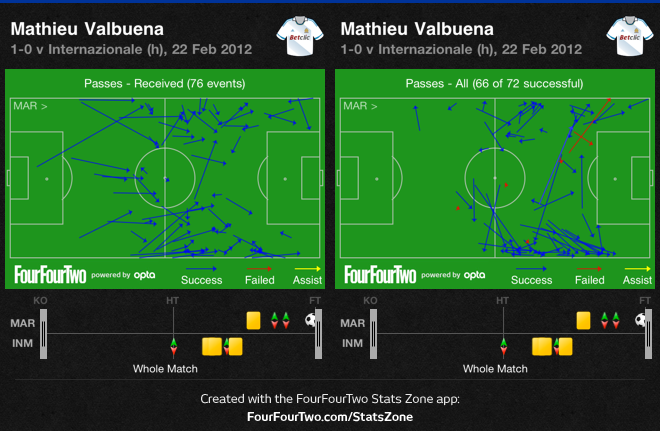 Valbuena also found lots of space and time on the ball, though he had to move out wide to find it. He helped overload the flanks and held up the ball well, though it meant Brandao was left a bit isolated, with no central player supporting him. Outwide, Ayew was a bit frustrating usually getting past his man only to play a poor cross. He looked better when he moved inside and allowed Monreal to overlap, as he was usually up against Lucio who isnt as good on the ground as he used to be. Amalfitano stayed wider, as he didnt get as much support from his fullback (who had more defensive responsibility), but his crosses werent much better than the rest of the team. Up front Brandao had a solid game. He held up the ball well and got others into play, and also won his fair share of balls in the air, though usually away from goal where he wasnt a threat. So while his build up skills were good, he wasnt a goal threat and never got the beating of Lucio and Samuel in the box (tbf the delivery wasnt up to standard). Overall, Marseille controlled the game well, dominating in possession thanks to Cheyrou and Valbuena, and stretching Inter with lots of width. But they didnt really have a goal threat through this approach, and there best bet was trying to get Ayew to make central runs, his goal came from a central position, albeit from a corner. The issue in this game wasn’t so much formation, it was the athletic players of Marseille. How many times did Zarte and Sneijder try to beat players one on one, Marseille wouldn’t not let them through. Marseille also used their speed in the midfield to make it hard for Inter to build an attack an advance their fullbacks. I think Inter need to a total revamp, and let some of the younger players play, ie Poli. Inter – Unlucky to have lost this game, though they should have defended the corner much better, and taken there chances. Defensively, they were set up to soak up any pressure Marseille from outwide. Lucio and Samuel were dominant in the air and easily defended the high amount of crosses sent there way. What marseille really have done is taken a leaf out of Montpellier’s book and provided late runners to surprise the defense (aka Cheyrou, Ayew making more central movements). The Inter fullbacks played very deep and defend well, especially Maicon, who didnt put a foot wrong. But they didnt provide any attacking input and Maicon again could have done more to get forward into the empty space ahead of him. Nagatomo did a much better job getting forward and gave morel some problems defensively. In midfield, Stankovic was poor as the holding player. They loom they are really missing Motta, and Stankovic is just no the right player for that position. Defensively he didnt have a direct opponent with Valbuena drifting wide, so he should have took a grip on the game like Cheyrou did, but his passing was very poor, misplacing simple balls and slowing down counter attacks. Zanetti did a good job helping out Maicon with Morel and Ayew, and got forward a few times to good effect when Inter broke. But he left Cheyrou with too much space and time on the ball, and this let Mareille dictate the game. Cambiasso had a great game though, and was Inters best player in my eyes. He got forward really well, combined with Sneijder and played some very good balls forward (his cross for Forlan was excellent). He also helped out Chivu at LB and rarely looked out of position. Further forward, I disagree with ZM, as I felt Forlan lead the line with Sneijder and Zarate playing off him. Sneijder drifted to the left to combine with Cambiasso in deeper positions, and had a good game finding space and playing some good passes. He got into good attacking positions and at times it seemed he was on a different wave length to his team mates (similar to when Van persie plays for Arsenal). Zarate played higher up and looked to use his pace on the break to stretch Marseille on the break and found some joy moving out to the flanks. His movement to the left helped overload that zone (similar to how Man city played against Man united) but his final ball was usually poor and he wasted good chances. Forlan was a surprise choice to lean the line, but actually had a good game, using his excellent technique to hold up the ball well and let Inter pour forward on the break. He was also a threat in the penalty area using good movement to fins space and should have scored early on. The problem was he, along with a few other players faded as they clearly were not fit (age catching up maybe on this old team). Forlan should have been replaced as he could no longer hold up the ball and Inter were playing longer balls nearer the end which clearly didnt suit him. The sub of Obi on for Zarate was good choice to lock the game down, and he offered pace on the break, but the refusal to replace Forlan or Sneijder was a mistake as they couldnt keep the ball up front to help relieve pressure. Overall, Inter were set up well to defend against Marseille and broke intelligently with Forlan, Sneijder and Cambiasso providing some intelligence and movement to there attacks. But they wasted chances and faded late on, allowing Marseilles to mount sustained pressure and then let in a poor marked corner. This Inter team seems well set up to play against Marseille and I wouldnt be surprised if they beat them in the return leg, but winning this competition? Not with this team. 44 crosses. like a brute force attack. Basel – Bayern was boring from German view. first half Basel had two big chances and Bayern (Ribery) had some too. but the Germans played a risk-avoiding style. passes from the centre of the pitch were poor (Kroos was not visible). the wide players received the passes in their feet and were forced to go 1vs1 or play back. Nearly no movement from the players without the ball. very boring. nearly no speed, no vertical passing, no decent crosses, no use of space. Basel was good, defence was solid (no surprise) and attacks were threatening. goal was a failure of 4 Bayern players don’t attacking the … who ever made the assist, and Rafinha left the back four and his opponent free in space. “Basel – Bayern was boring from German view” …from anybody view it was not boring ..infact it was most exciting of the entire round of CL…from the get go both teams were playing at relentless pace..the initial 25 minutes were like last 25 minutes of match…i am not sure how good they were tactically but that what zonal marking is best at…..i hope Michael do the Basel vs Bayern game review..looking forward to that!!!! on another note ..thanks to zonal marking on other articles of month feb..they were excellent ..keep up the gud work!!! most exciting of the entire round? havn’t seen every match, but i think Milan – Arsenal was better. tactically i think basel – bayern was not that bad, because we may learn how not to do it (looking at bayern). Similarly where u said Arsenal played poor , here Bayern played poor too ..but dont take credit away from basel ..milan is big team with big players , even if arsenal hv played gud it would just more exciting in terms of tactics not that arsenal would hv certainly win..here Basel is considered Minnows ..Bayern where playing poorly could hv beaten them , they had their chances ..but i think basel played excellently , with some gud tactics & hardworking ..United took them lightly & it costed them & i think they will upset bayern too !! No, I don’t want to take credit away from Basel. But it was not like the best game of this round. Basel had great chances, but Bayern had chances, too. Basel was good at the back, because Bayern was so poor. Also, Bayern had so much possession (like 70%) and no idea what to do with the ball. that was the major part of the game. Maybe it’s just coz i’ve seen Borussia Mönchengladbach against Bayern, and that was a great game (from Gladbach). Bayern has no plan how to deal with tactically good teams that defend well and try to counter-attack. They are not able to play vertical against teams like Basel, Gladbach or Hannover. Their approach to football is more or less from yesterday. @Lyri : Well… That’s your point of view. One match concerned 2 major teams of 2 big nations of soccer. One concerned 1 big team of 1 big nation. So I don’t think that FCB-FCB interest more people than OM-Inter. 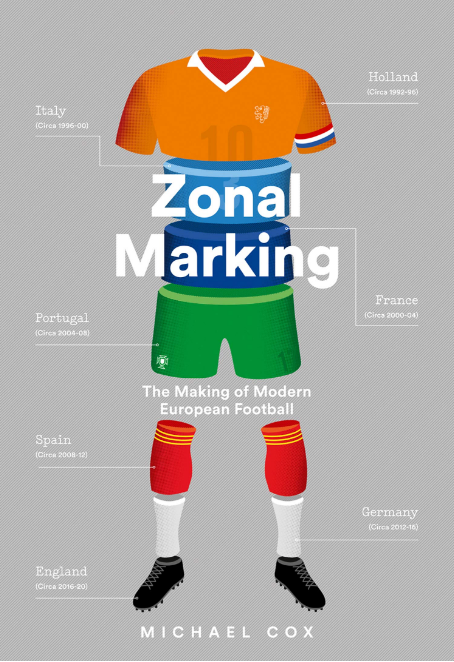 Zonal Marking analyses rarely enough french teams, so I won’t complain when they do. @ZM: Keep doing this way! I love your work! P.S. You might have underlined a bit more the quality of Forlan moves off the ball. He was the main interist threat and with a good Sneijder the match could have been totally different. Marseille have become very dependant on crosses these past few months, which explains the amount of attempts today. Azpilicueta and Amalfitano are two of the best in France crossing and Rémy and Ayew have excellent jumping and timing skills and often score from right-wing crosses. However, 44 crosses is way too much in this type of game and you could tell that Rémy’s absence left them with no other real option than pray for Brandão’s 1m89 to pick something out of the air or Ayew to come in from the left. Tough luck, the Brazilian was up against Lucio and Samuel and they sonned him throughout the game. Ayew was having a terrible game so he wasn’t contributing much. His mental skills allowed him to wake up late in the game though, and we saw the result with that goal. Rémy’s return, if he’s fit, should be interesting enough for the game in Milan. Inter having to score a goal will open up space for his speedy running. If Lucio and Samuel are playing again, they might be the ones getting sonned this time. As always, thanks for the good work Michael! From the reading Inter seem to have neutralized OM successfully. So there were no chance for OM from the center of the pitch? ZM what’s your opinion on current dissapointing Inter performances? Individual problems? Sancho’s post above seems to answer some of it. I think that Inter’s formation was more like christmas-tree (4-3-2-1) rather than 4-3-1-2. Snejder was on the left behind the lone striker and Forlan and Zarate was changing places between the right side and the striker when Inter was defending depending on their position when Inter lost the ball. When Inter had the posession Forlan/Zarate moved forward from midfield, Sneijder was on the left all the time waiting for ball and then the formation was more like left-weighted 4-3-1-2 but on the overall I would rather describe it christmas-tree formation. That formation was probably also the main reason that more mobile Zarate and Forlan started instead of Pazzini or Milito. Yeah I agree with that. When they pressed high up, often either Zarate or Forlan would press appropriate FB as well. 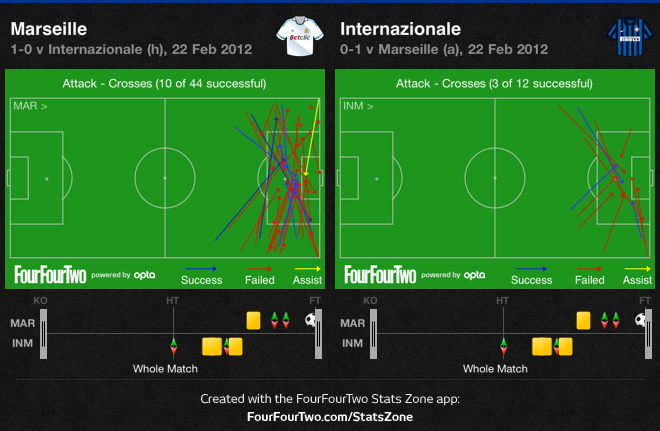 I think the movement on the left was a key point for Inter. With Cambiasso, Sneijder and Zarate often moving towards there it meant usually one got space. The first chance for Inter came because Sneijder pulled Azpilicueta away from his position and Cambiasso was released with his vertical run behind. Their mobility in that area was good. Quite an interesting tactic from Marseille to me. Essentially playing 3 wingers AND having fullbacks surge forward. All in on crosses, with 44 attempts. Depends on the team, Lucio and Samuel would probably be happy facing that tactic, as would any team the likes to counter through the wings. Agreed. Remy and especially Andre Ayew are excellent in the air if left alone but not very effective when properly challenged by a tall defender. And Brandao…let’s just say scoring isn’t what he does best. Tbh I’m not entirely sure the excessive crossing was intentional. OM have been very poor at creating this season and with the attacking options up front pumping high balls into the box seems to be born out of desperation rather than being a well crafted plan. Poor lad is pants in Nerazzuri colors. I can understand choosing him over Nagatomo for positional reasons, but his concentration is severely lacking at times. I thought Chivu had a great game until he let Ayew slip for the goal. He was winning the ball very well and keeping Marseille away nicely, especially considering that they were attacking almost exclusively down his side. I’d say it was just bad finishing, the score could have just as easily been 3-3 or 3-2 in Inter’s favour, but it wasn’t. Chivu was terrible but also Stankovic, he didn’t look fit and made lots of mistakes. Zarate could never run past an opponent, Inter can’t expect to win games by playing 8-9 fit players. I like that the less-popular, less-rich teams have decent chances of going through. From that list, only Milan and Barca strike me as true giants of European football. Of course, we may end up with a final 4 of Barca, Milan, Bayern, Real and the dreams of minnows could be just dreams. But hey, it’s interesting to think about. Stankovic was poor in this game, he had the most time on the ball for Inter (with Valbuena poor defensively) yet never took control of the game. His passing was poor, with little imagination and even simple balls not on target. I think there display shows how much they miss Motta, very underrated player who was an important piece of the champions league team. Stankovic should never be played in the 3-band. Andrea Poli, who is in great form, should always be playing in front of him. Also Palombo is in a similar mold and probably a better bet than Stankovic. Is it just me, ZM, or is Thiago Motta missed. He may not have been superb defensively, but he was dynamic and generally consistent with his distribution. By the way, love the site, and your other articles for other sites; good, non-subjective football analysis is very hard to find these days. For most recent news you have to pay a quick visit web and on web I found this web page as a finest website for newest updates. 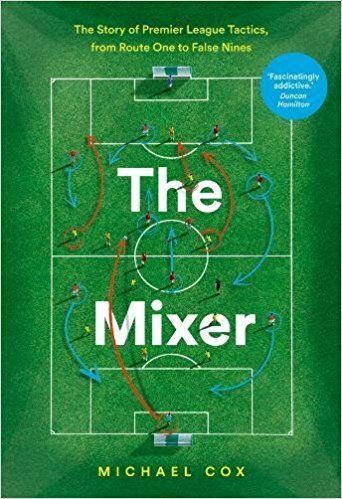 I love French and Italian football and this is refreshing to see analysis of such games rather than the usual Premier League games. Thanks, Guillaume, actually, I was referring to his departure, you misunderstood my comment, I did not think that he was AWOL for no reason. I was noticing that Stankovic is less comfortable as the deepest of the 3 in 4-3-1-2. But apart from that, it is interesting that you find French and Italian football lovable.